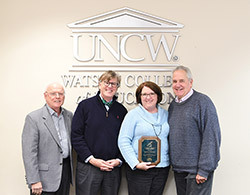 Becky Walker, instructor in WCE’s Betty Holden Stike Education Laboratory, is the 2018 recipient of the Robert E. Tyndall Service Award. 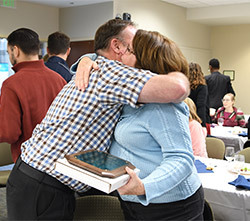 The award is presented every two years to a non-tenure-track WCE employee in recognition of dedication to teaching, commitment to the college, ability to work well with all constituents and the capacity to lead his or her area in a new direction. Walker has touched the lives of thousands of future teachers for more than two decades, first as a part-time Ed Lab coach and course instructor. She has taught courses in math methods and children’s literature, and supervised interns. Because of the value of her contributions to grow the Ed Lab’s programming, her position became full time in 2009. Ed Lab Director Brian Brinkley nominated Walker for the award with support from more than 20 Watson College faculty members. The Robert E. Tyndall Service Award honors the leadership and vision of Robert E. Tyndall, who served as dean of the education school from 1991 to 1999 (later named the Watson College of Education). He also served as UNCW’s associate provost, vice chancellor for information technology, vice chancellor for public service and continuing education and executive-in-residence at UNCW’s Cameron School of Business prior to his retirement in 2017. Among Tyndall’s accomplishments was a focus on recruiting non-tenure-track employees to enhance the college’s educational mission. Tyndall also established the Razor Walker Awards, which have been presented since 1993 to people who have made a difference in the lives of young people. Tyndall presented the 2018 award to Walker at the Watson College holiday luncheon on January 10.